Laptops started out as computers you could carry with you, completing all your pursuits on the go without the restriction to be tethered to a workstation. While they have, over time, evolved into much more than that—style statements, entertainment portals, and best friends—one of their prime utilities continues to be the ability to replace desktops. In the modern-age marketplace, 17-inch laptops are best suited as full-purpose machines that offer you the muscle of a desktop in the packaging of a laptop. Leading brands in the industry like Acer, ASUS, Dell, HP, Lenovo, LG and MSI have several products in this league, and they sell like hotcakes to audiences looking for computers that can fuel their high-energy, demanding lifestyles. For all their utility and strength, 17-inch laptops don’t have it easy. They face substantial competition from machines of smaller—and leaner—form factors, such as 15-inch systems. It is no secret that 17-inch laptops can be cumbersome to tow with you, and few products in this class manage to be somewhat light and thin. If your job demands that you travel often or if you need a portable computer that can last unplugged for several hours, a 17-inch laptop might not be the most convenient option for you. However, here’s what these mighty systems definitely bring to the table: a wide, spectacular display and innards spacious enough to host high-performing CPUs and storage. If your work-life or personal needs require immense computing strength and visual brilliance, you will be well off with one of these. We have consolidated some of the very best 17-inch laptops 2019 suited to a multitude of needs and price points. But before we jump to the recommendations, let us get up to speed on some essential know-how on 17-inch laptops. Should You Really Purchase a 17-inch Laptop? One of the biggest reservations with purchasing a 17-inch laptop is its sheer bulk. How will you lug along the mammoth; how will it ever fit into backpacks or rucksacks that you carry to the office? Most 17-inch laptops also don’t promise long battery life, which limits their portability. And, of course, the shoe really starts to pinch when you consider the price; few 17-inch laptops come in cheap. Making peace with all these limitations only for a larger screen doesn’t seem to be a wise decision. Except: it can be. When you purchase a 17-inch laptop, you don’t pay a premium only for a larger screen but also, typically, a powerful processor, superior graphics, and the CPU muscle to cater to both day-to-day tasks and intensive pursuits like multimedia editing, wireless streaming, and gaming. Many of these machines also boast of expansive memory (frequently fitted with high-speed SSDs) and efficient cooling systems for sustainable operation over long hours. Indeed, most 17-inch laptops are equipped with abundant USB ports and offer adequate provisions for internet connectivity. Add to that mix a full-purpose keyboard, and you essentially have a near-desktop machine in the garb of a laptop. So, while 17-inch laptops might be bulkier, pricier and unsuitable for frequent travelers, they are perfect for anyone who prioritizes performance over all else. To their merit, these computers can usually fit into multiple shoes—that of workstations, entertainment portals, as well as gaming machines. Display & Graphics: Pick a machine that offers a dedicated GPU (preferably NVIDIA RTX or GTX) and has a monitor with an optimal resolution (1920 x 1080) and high refresh rate (144Hz). If you also get an anti-glare screen, an IPS panel, high brightness (300 nits or above), and a full color gamut, you will be able to make the most of all that real estate. CPU & Memory: Don’t settle for anything less than an Intel i7 processor, 16GB RAM, and a 256GB SSD. If you have the budget (and the requirement), the top of the market is occupied by Intel i9 CPUs and laptops that offer up to 32GB RAM and more than 1TB of storage. Since 17-inch laptops are targeted at users who crave high performance, a less than competent CPU configuration will be a major disappointment. Custom features: Finally, ensure that your choice of a laptop has provisions tailored to your needs—such as a backlit keyboard for gaming or plentiful USB ports for collaboration and data sharing in the workplace. You will also have to keep an eye on the price tag; some 17-inch models are available for sub-$1000 prices. If you desire to etch out a balance between performance and portability, explore models on the lighter side of the weighing scale—17-inch machines that weigh about 4–7lbs. What we love best: The grand display, for sure! 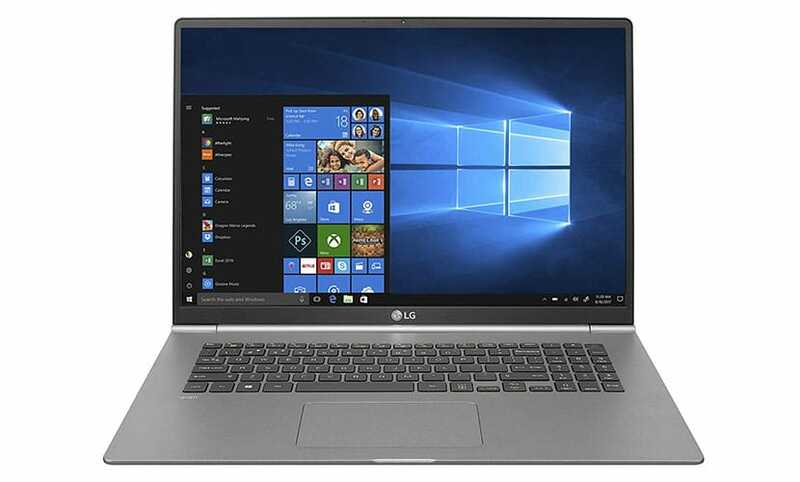 The LG Gram 17Z990 laptop has a WQXGA display (Wide Quad Extended Graphics Array) with a screen resolution of as much as 2560 x 1600 and a comfortable aspect ratio of 16:10. You can avail of the DTS Headphone:X to further enhance your experience with 11.1-channel surround sound. Another huge bonus: amazing battery life and portability. Surprisingly for a 17-inch laptop, the lithium battery on this one (72Wh) can last up to 19. 5 hours! This is enough and more for even the longest workdays and almost unrivaled in the league of 17-inch laptops. It weighs an unbelievably low 2.95lbs and has a thickness of 0.7”—by far the thinnest and leanest on this list. LG has carefully put together a portable 17-inch laptop that combines performance with spellbinding mobility. An Intel i7 processor drives this machine, supported by 16GB RAM and a 512GB SSD. Build-wise, while this laptop is almost impossibly light for its size, the construction is reliable and long-lasting (MIL-STD-810G). LG has used premium nano-carbon-magnesium for the chassis, and this makes the machine lightweight and durable at the same time. Facilitating accessibility on the run is a fingerprint reader that, with Windows Hello, lets you log in minus the need to type in a lengthy password. The keyboard is backlit too, which allows you to work in all kinds of ambient lighting. Further, the touchpad supports multi-touch gestures (up to four fingers). Keeping you connected with the world are a webcam (on the top bezel), a USB Type-C port, three USB 3.1 ports, and an HDMI to connect to external displays. On the flipside: This laptop uses Intel HD Graphics 610 (integrated). You will miss out on the power and brilliance of a dedicated GPU which can severely limit gaming potential. What we love best: The ASUS VivoBook Pro 17 N705FD-ES76 is one of the most portable 17-inch laptops on the list, weighing a mere 4.85lbs. It is also incredibly thin at 0.8”. Carry this aluminum-build laptop with ease and enjoy the large screen without added weight or bulk. The swift charging battery powers up to 60% in 49 minutes, which further boosts the mobility and limits the amount of time you need to spend glued to a power station. VivoBooks have mastered the art of portability and adapting to contemporary lifestyles; the ASUS VivoBook Pro 17 continues the tradition. Even though it has a huge 17.3” FHD screen and a powerful Intel Core i7 processor, it manages to remain lightweight and lean, perfectly suiting all those who demand great power hand in hand with convenient mobility. The CPU is well supported by 16GB RAM and a 256GB SSD (in addition to a 1TB HDD). The display is topnotch, with a wide-view monitor (178-degree), a color gamut of 100% sRGB and 72% NTSC, and software enhancement by the ASUS Splendid technology. Plus, the NVIDIA GeForce GTX 1050 graphics card with 4GB of dedicated memory ensures captivating imagery that does justice to any multimedia content you choose to play. This is complemented by a top-of-the-class audio system, comprising stereo speakers with smart amplifiers, the Harman-Kardon edge, and the innovative ASUS SonicMaster technology for richer bass and volume. Another exceptional feature of this laptop is its superb device support and accessibility. You will find a USB-C (Gen1) port in addition to a USB 3.0 port (Type-A), two USB 2.0 ports, an HDMI, as well as a fingerprint security reader. The 802.11ac Wi-Fi (2×2) helps provide consistent connectivity, minimizing network congestion. A full-size backlit keyboard with a key-travel distance of 1.4mm makes unending hours of work ergonomic and pain-free. What we love best: How affordable is the HP Pavilion 17-inch laptop and how committed to delivering cost-effectiveness to the consumer! At a sub-$500 price, you get a 17-inch screen, an AMD A9-9425 processor, and other desktop-class features like a full-purpose keyboard and extensive options for device connectivity. If you are scouting for a budget 17-inch laptop, it really doesn’t get any better than this. Under the hood, this laptop is equipped with a highly customizable processing configuration. You have the choice to opt for up to 16GB RAM (minimum 8GB) and up to 1TB SSD (minimum 128GB). Additionally, you can also avail of an optional second optical drive—up to a 1TB hard drive. While your budget and requirements will dictate this choice, you should find the minimum settings responsive and speedy enough for everyday endeavors. The higher settings will become essential for processor-draining pursuits like image editing. Notably, this is also a fairly lightweight machine—it weighs 5.42lbs. This is well within the portability standards for laptops in this class. It has a thickness of 0.96”. 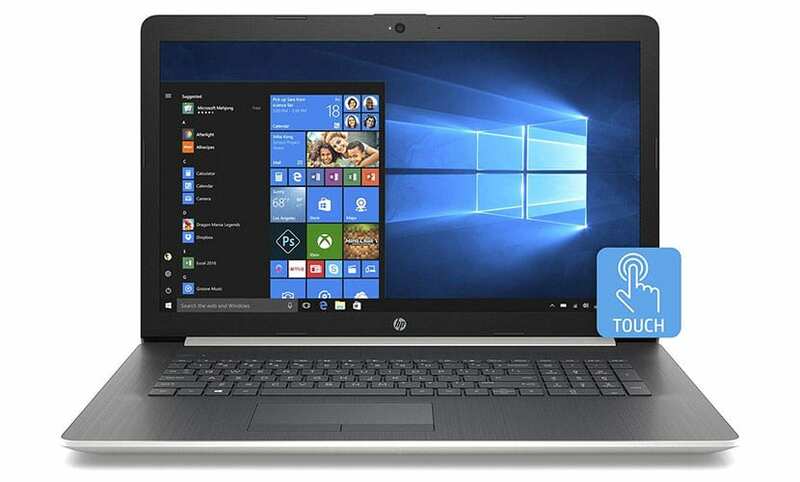 The device support offered by this laptop is ample: two USB 3.1 Gen 1 ports, one USB 2.0 port, an HD webcam (with HP TrueVision), a multi-format digital media reader, and one HDMI port to plug in external displays. It also supports 802.11b/g/n/ac Wi-Fi and Bluetooth. On the flipside: This laptop is driven by an AMD processor, which, although typically cheaper than its Intel counterpart, may leave you wanting when you need to engage in CPU-draining activities. The processor can be boosted up to a maximum burst frequency of 3.7GHz—considerably lower than the 4.6GHz offered by an Intel Core i7. Likewise, the graphics support is for Intel UHD 620 Graphics; there isn’t a dedicated GPU to fuel extraordinary visual brilliance. What we love best: The devotion to gaming! The Dell G3779-7934BLK-PUS 17 laptop is fine-tuned for gameplay with ample provisions across the board to simplify things for you on the arena. An Intel Core i7 processor meets the power of an NVIDIA GTX GPU, complemented by an efficient cooling system (dual fans), compelling sound by Waves MaxxAudio Pro, and a sleek design with multiple USB ports to plug into peripherals such as controllers and mice. A WASD backlit keyboard lets you game on even in low-light settings. 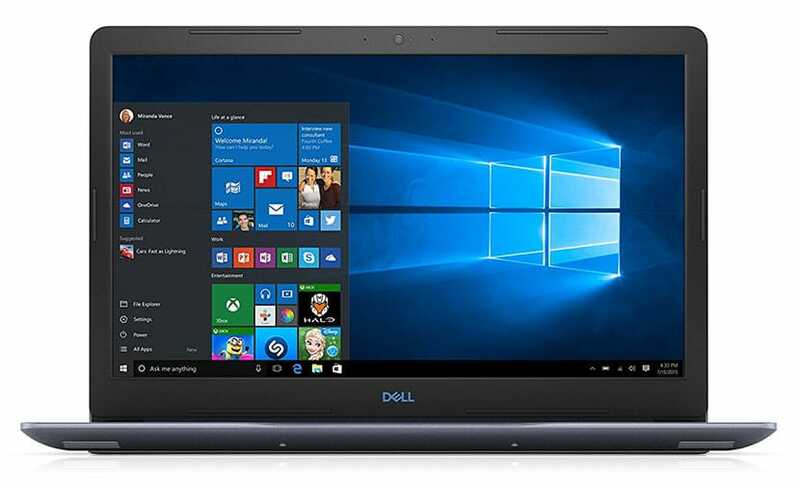 At a price tag below $1000, this Dell laptop truly delivers a lot. The processing muscle comprises 8GB of RAM and a 128GB SSD (with a 1TB HDD). You can easily upgrade the available RAM up to 32GB, based on your requirements. On the visual front, the NVIDIA GeForce GTX 1050 Ti graphics with 4GB of dedicated memory helps to create a captivating A/V experience. Since the FHD screen with anti-glare and a full resolution of 1920 x 1080 also has an IPS panel, you are assured of distortion-free imagery. Even when you are streaming content, the SmartByte technology ensures that the proceedings are seamless. Gaming machines need to be well-connected, especially if users intend to participate in competitive sessions or online marathons. To this end, Dell has equipped this laptop with an Ethernet port (100/1000 Gigabit connections), 802.11ac Wi-Fi, an HDMI port, and a Thunderbolt 3 port. The latter offers not only high-speed data transfer but also supports external displays (one 5K or two 4K displays). The fact that this laptop is reasonably thin at 25mm or 0.98” (the thinnest 17-inch laptop in the Dell G Series line-up) also ups its utility as a collaborative gaming machine. Note that it weighs 7.2lbs. What we love best: The Acer Aspire 7 A717-72G-76V1 is committed to design. The chassis, built from a premium magnesium alloy, is both lightweight and durable, while the thin-bezel adds a distinct level of immersion to the 17-inch screen. This laptop is not only highly functional, but it is also stylish enough to stand out in a crowd. 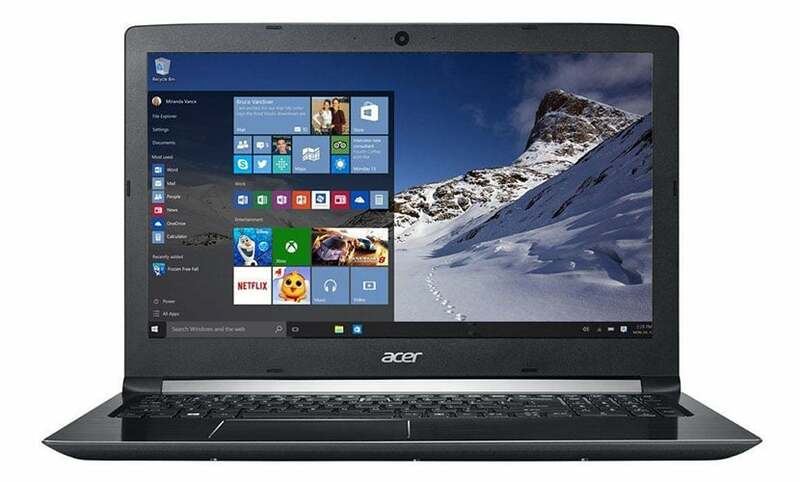 With this machine, Acer achieves a unique blend of performance and razzmatazz, pairing an Intel Core i7 CPU with NVIDIA GeForce GTX 1060 graphics with 6GB of dedicated memory. The RAM support is for 16GB while the storage space provided is a 256GB SSD with a 1TB HDD. This is sufficient for all users interested in intensive professional assignments (read software simulation, heavy-duty applications), some degree of gaming, or playing back multimedia content. One word: versatility! Fortunately, the GPU receives generous support from the FHD monitor with a screen resolution of 1920 x 1080 and ComfyView technology. An IPS panel adds to your overall viewing comfort. On the connectivity front, too, Acer does not cut corners. This computer has two inbuilt USB 2.0 ports, a USB 3.1 Gen 1 port, one USB 3.0 port, an HDMI, as well as support for 802.11ac Wi-Fi and Gigabit Ethernet. This permits you to connect to any devices or external displays you might require as well as get onto the internet with considerable speed and consistency. There’s another feather in this laptop’s cap. While it certainly provides the strength you expect from systems with this form factor, it also sprinkles a fair degree of mobility. 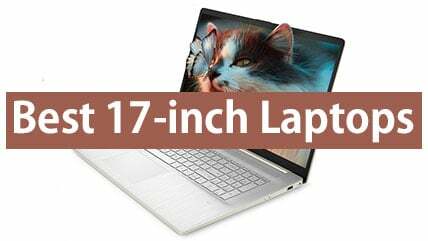 At 6.61lbs and 1.1”, it is lighter than many other 17-inch laptops. The durable build ensures you can carry it with you without being afraid of transit damage. 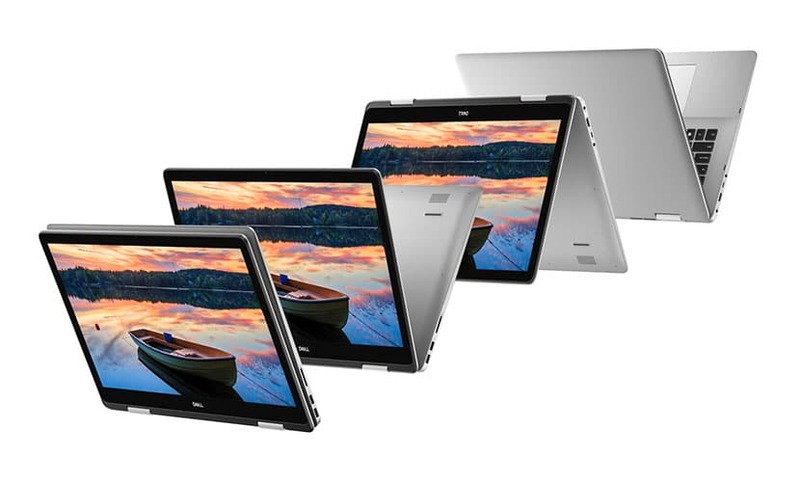 What we love best: For a 17-inch laptop, the Dell Inspiron 17 7000 Series 7786 2-in-1 is amazingly flexible. It supports four different modes of operation, each tailored to unique functions, intended to enhance user comfort. For instance, besides the regular laptop style of use, you get to experience the stand mode—ideal for watching multimedia content. The tablet mode, in turn, suits reading pursuits best. You can avail of the tent mode for sharing content or viewing recipes, presentations, etc. When you have a large screen in addition to such flexibility of use, you know you have your hands on a winner. The cherry on the cake: an audio system by Waves MaxxAudio Pro for ultimate listening delight. Dell has never skimped on performance, and here too, the CPU is a solid Intel Core i7, together with 16GB RAM and a 512GB SSD (plus 32GB Optane Memory). The NVIDIA GeForce MX250 graphics has 2GB of dedicated memory and renders all your imagery in style. It helps that the FHD screen has an IPS panel and touch (Truelife Touch) for easy accessibility. For all its features, this laptop doesn’t come across as excessively bulky—it weighs 6.08lbs and has a profile with a thickness of 0.63–0.85 inches. This is thin enough to fit into bags, enabling you to tug along your full-purpose laptop to meetings and lectures. The build is quite attractive too, with contrasting finishes (anodized, hairline and diamond cuts). Further boosting the portability of this machine is the compliance to 802.11ac Wi-Fi (2×2) and Bluetooth as well as the ample assortment of USB and other ports (two USB 3.1 Gen 1 ports, one USB 3.1 Type-C port, one HDMI, and an SD card reader). What we love best: Impressive dedication to bringing you the best visual experience ever. 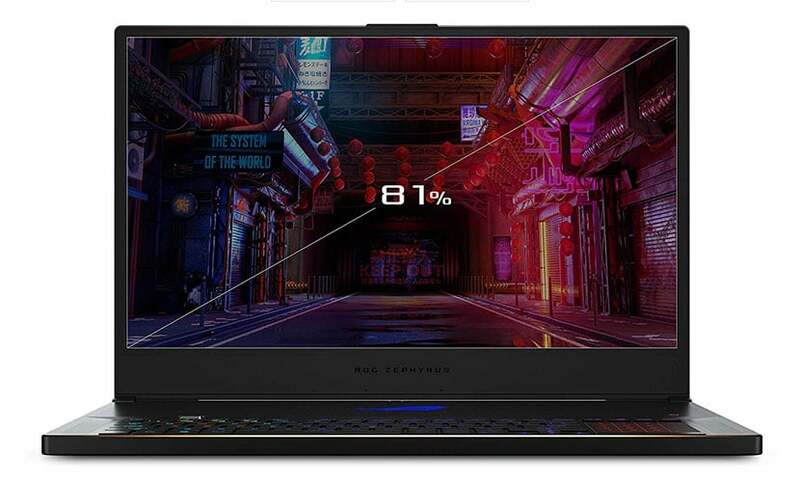 The ASUS ROG Zephyrus S GX701GX-XS76 laptop has an NVIDIA GeForce RTX 2080 graphics card with 8GB of dedicated memory and G-SYNC for minimal tearing. The difference that RTX—based on Turing architecture—makes to gameplay has to be seen to be believed. Features like real-time ray tracing and imagery enhanced by artificial intelligence will delight even the most passionate gamers. Besides the competent GPU, the display is also superior to that provided by many contemporaries, with a narrow bezel (6.9mm or 0.27”), a refresh rate of 144Hz, a swift response time of 3ms, and Pantone validation for precision in colors. The narrow bezel helps keep the screen-to-body ratio as high as 81%. Since this ASUS laptop is evidently aimed at a gaming audience, its processing prowess is exemplary. You get an Intel Core i7 processor with 16GB RAM and a 1TB SSD. The immense power is kept sustainable by the active aerodynamic cooling system with 12V fans and anti-dust technology—an ROG-exclusive provision. 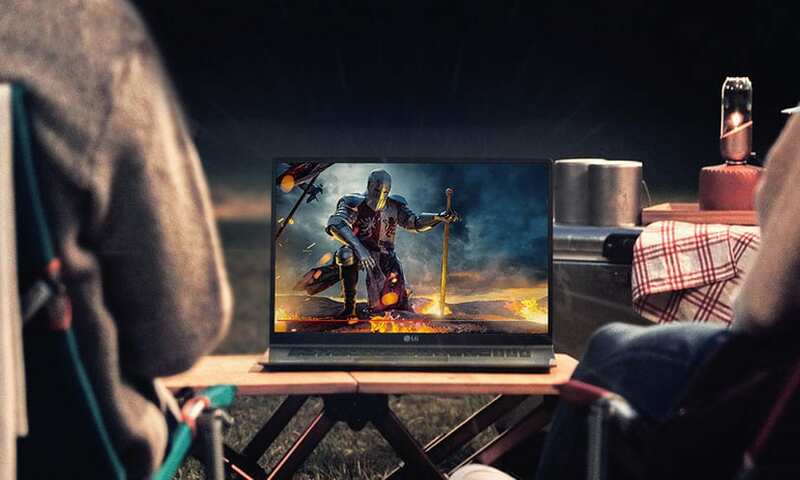 Further, the laptop also offers a unique “GPU switch mode” that lets you alternate between discrete and integrated graphics when you need to prioritize gaming performance and higher battery life respectively. How about the build? Well, the leanness of the profile is impressive at 0.73; it weighs 5.95lbs. Interestingly, this computer comes with a smaller 65W adapter that further reduces the weight you have to bear; you can also use portable power packs to charge up (thanks to USB Power Delivery). 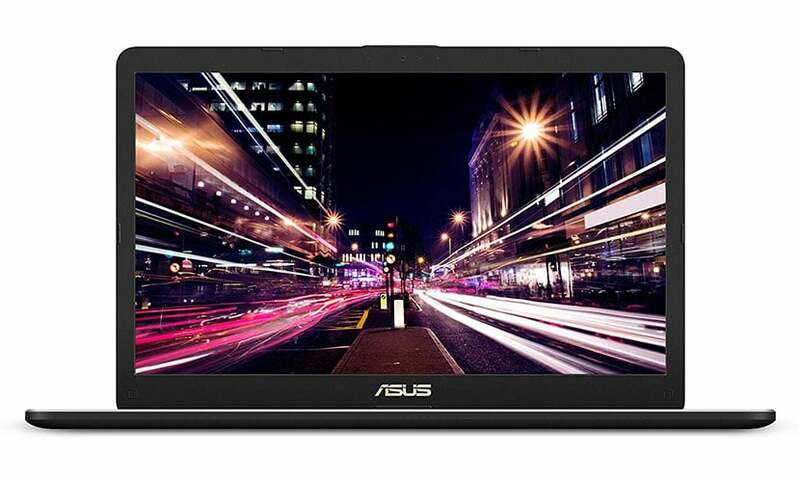 ASUS claims that the dimensions are almost 23% smaller than the standard 17-inch laptop, which is saying a lot. 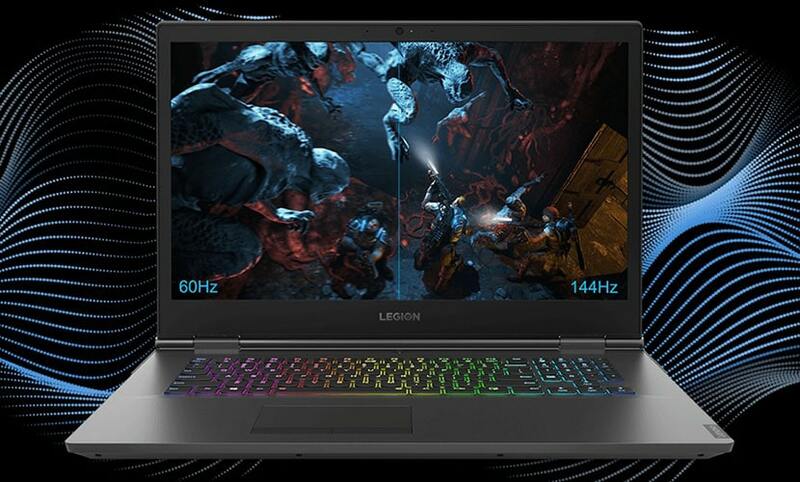 In additional features, this gaming laptop has a detachable webcam (1080p, 60Hz), an RGB keyboard with per-key lighting for spectacular ambiances, and several USB ports including a Type-C one. What we love best: Exceptional cooling system! 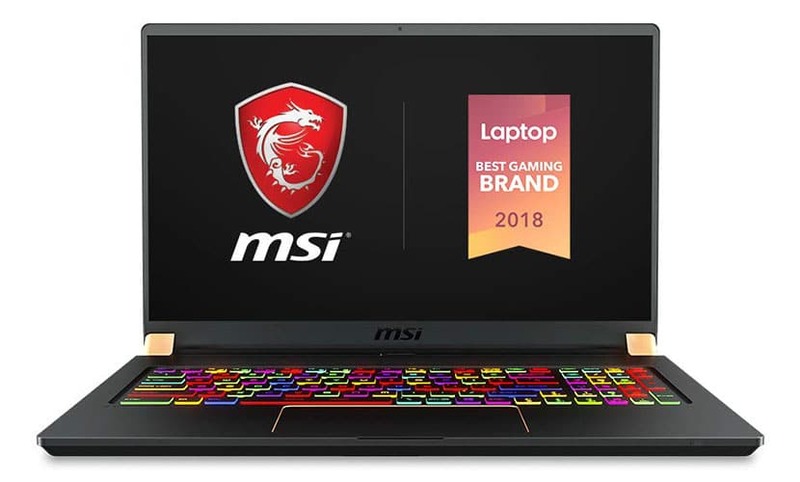 A powerful gaming laptop with an Intel Core i7 processor and NVIDIA RTX graphics, the MSI GS75 Stealth-204 also invests heavily in longevity. It has a heat dissipation system comprising three fans with up to 47 blades each, seven heat pipes (copper), and four exhausts—a reliable arrangement to dissipate heat and keep the laptop functioning at optimal settings for long durations. Another useful feature of this computer is its gaming-friendly keyboard with a smooth touchpad that is 35% larger than in older models and supports 10+ gestures. It majorly simplifies things during gameplay, giving you a distinct edge over competitors. MSI has created a mega-attractive gaming laptop in matte black with gold-diamond cuts, as powerful to behold as it really is within. The CPU muscle is supported by 16GB RAM, a 256GB SSD, and battery life of 8+ hours. A power adaptor that is 28% slimmer simplifies battery charging when you are on the go. A thin-bezel (5.2mm or 0.2”) makes the monitor immersive, realizing a screen-to-body ratio of 85%. The FHD display with a refresh rate of 144Hz, a response time of 3ms, and, of course, RTX graphics lives up to the expectations of even demanding gamers. Accessibility-wise, this laptop is beyond satisfactory. It has an RGB backlit keyboard (Steel Series Engine 3) with customizable per-key lighting. The dual internet provision of LAN and Wi-Fi (Killer Gaming Network E2500, Killer N1550i Combo and Killer xTend) provides an optimal online gaming experience. The lightweight chassis that weighs 4.96lbs and measures 0.8” ups the overall mobility of this laptop, making it easy to transport to outdoor gaming marathons. 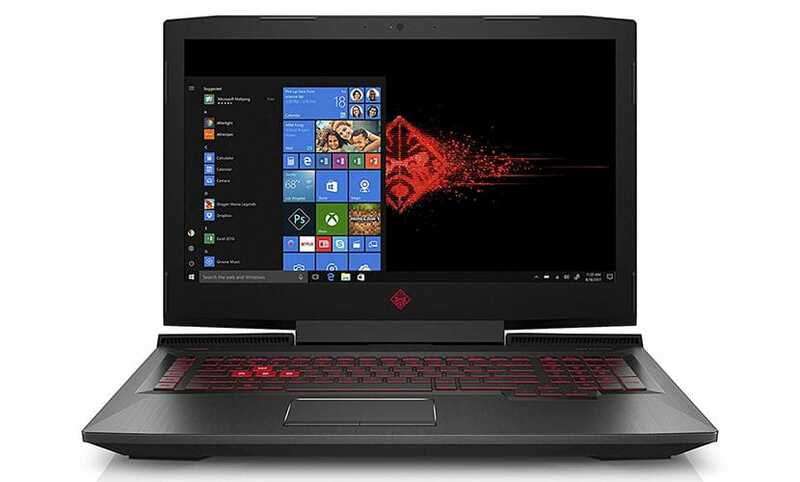 What we love best: The HP OMEN 17-an120nr is a sound, all-rounder laptop well-suited to standard computing endeavors. Even if it is gaming that sets your pulse racing (and you have the budget), this is a good find. It is energized by an Intel Core i7 CPU, 16GB RAM, a 128GB SSD (and 1TB HDD), and NVIDIA GeForce GTX 1060 graphics with 6GB of dedicated memory. This laptop offers some handy tools for gamers keen to emerge as victors: a refresh rate of 144Hz and an anti-glare panel for reduced eye strain during long hours of gameplay. Over time, HP has cemented its reputation as a computer manufacturer you can fall back upon. Even though its latest products are new-age, encompassing the latest trends in gaming and general computing, it doesn’t miss out on the staples. So, this computer offers reasonably decent battery life—up to 6.75 hours on mixed usage and up to 5 hours on video playback. If you use your laptop for wireless streaming, you should still get about 4.25 hours of juice. HP equips this laptop with a superior audio system (Bang & Olufsen) for delightful A/V experiences. How is the accessibility? Well, the CPU compartment offers one-panel access. The keyboard is backlit and supports 26-key rollover in addition to anti-ghosting. This comes in handy when gaming gets frenetic, and you find yourself keying in multiple presses in one go. Internet connectivity is made possible through 802.11.b/g/n Wi-Fi. On the flipside: This HP laptop is somewhat low on portability. It weighs 8.33lbs which is heavier than many others on this list and has a profile measuring 1.3”. While powerful in its own right, it may not be too convenient to lug along in your case. What we love best: The Lenovo Legion Y740 does a mean job of building high-quality visual and auditory experiences, perfect for gaming with a difference. The system lighting by Corsair iCUE is brilliant, as is the audio by Dolby. A specially engineered Dolby Atmos Sound Bar brings you enthralling audio even when you don’t have your headphones on. This commitment to top-grade multimedia creates a significant difference in your gameplay and sets you apart from the crowd. This Lenovo offering matches some of the other recommendations on this list in performance. It is fueled by an Intel i7 CPU, 16GB RAM, a 1TB HDD, and NVIDIA GeForce RTX 2060 graphics with G-SYNC and 6GB of dedicated memory. An effective cooling mechanism (Coldfront) with four thermal vents and 70 fan blades per channel helps to dissipate heat with negligible noise or interruption to the proceedings. Let’s talk about the graphics, clearly the mainstay of this computer. The FHD screen boasts of an optimal refresh rate of 144Hz and a brightness of 300 nits for vivid imagery. Thanks to the High Dynamic Range (HDR) by Dolby Vision, you can experience a wider gamut of colors and contrasts. As for the RTX graphics, you know you are signing up for a future-forward graphics technology that elevates your game by several notches. In the looks department too, this machine manages to stun. It has an all-aluminum chassis that weighs 6.17 lbs and has a thickness of 0.91″. This is quite portable for a device with specs as powerful as this. Note that this computer supports Killer Wireless 802.11 AC (2 x 2) and Bluetooth 4.1 and has a large array of ports, including two USB 3.1 Gen 1 ports and an HDMI. So, Ready to Bring Home a 17-Inch Behemoth? We hope you found the 17-inch laptop of your dreams in our comprehensive list. These machines are increasingly getting more adept at fulfilling a wide spectrum of needs, and you are likely to find something after your own heart, whether you crave a performance edge for work assignments or triumphs on the gaming arena. For instance, the ASUS ROG Zephyrus S GX701GX-XS76 (#7) is an ideal choice for gaming enthusiasts who long for an immersive display and minimal tearing or lags during gameplay. The HP Pavilion 17-inch laptop (#3), on the other hand, is well-suited to budget-watchers who wish to achieve equilibrium between cost-effectiveness and efficiency. While setting out to purchase a 17-inch laptop, remember that you will be making some compromises in mobility, battery life, and overall convenience of transport. Assess your lifestyle, and see if you would be better off with a juggernaut that does not stop at anything but needs effort to be lugged along, or a nimbler and niftier computer that is lower on brute force. With a 17-inch laptop, the reassurances are several; the speeds, flexibility of use, and the semblance of a desktop-like work environment are sure to be unparalleled.